According to a recent survey of over 14,000 expats around the world, Ecuador has been placed as the top destination for expats. It is reported to be a country where expats are happiest. In addition, along with Mexico, many expats are planning to stay permanently (44%). It also scored highly for being a welcoming place. The country is becoming a popular destination for retiring expats, particularly North Americans. The International Living Global Retirement Index placed it as the number one place to retire to this year. This is partly due to the fact that that it is generally an affordable place to live. The warm climate in Ecuador is also a big pull factor. It also has a diverse landscape including beach resorts, rainforests and mountainous regions so there’s plenty to explore and something for everyone. There is a large variety of wildlife across the nation including tortoises and dolphins on the Pacific coast and monkeys and lots of interesting birdlife in the Amazon rainforest. Some of the most popular places for expats to retire to are the capital Quito, the mountainous city of Cuenca and Vilcabamba. 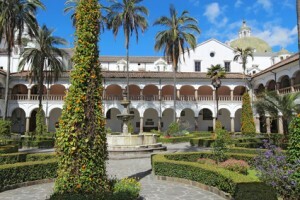 Cuenca in particular is a great place for expats; rich in culture, history and colonial architecture, it is a beautiful city which is also very walkable. 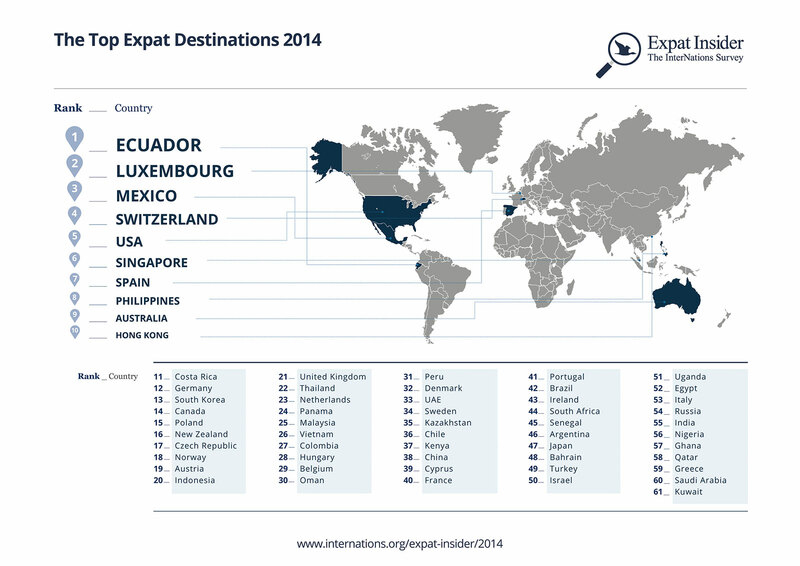 The top ten expat destinations were: Ecuador (1), Luxembourg (2), Mexico (3), Switzerland (4), USA (5), Singapore (6), Spain (7), Philippines (8), Australia (9) and Hong Kong (10). As is often the case, Switzerland is rated number one for quality of life. Nigeria is noted as offering the highest salaries for expats. The country is popular for workers in the oil industry where accommodation is often paid for. Luxembourg was rated highly for career opportunities. Not surprisingly, Greece was at the bottom of the table, its economic crisis meaning poor scores for many categories. Only 5% of respondents said that spouses were offered cultural or language classes for their new destination, highlighting an area where employers could offer more support to increase ease of expatriate settlement. Different types of expat were identified and profiled including the ‘Foreign Assignee’, the ‘Career Expat’, the ‘Travelling Spouse’, the ‘Greener Pastures’ expat and the ‘Globetrotter’ among others.